Even if you’ve never heard the music of Italian composer Luciano Berio, you’re probably familiar with the music of some of his contemporaries: John Lennon, Paul McCartney, George Harrison and Ringo Starr. 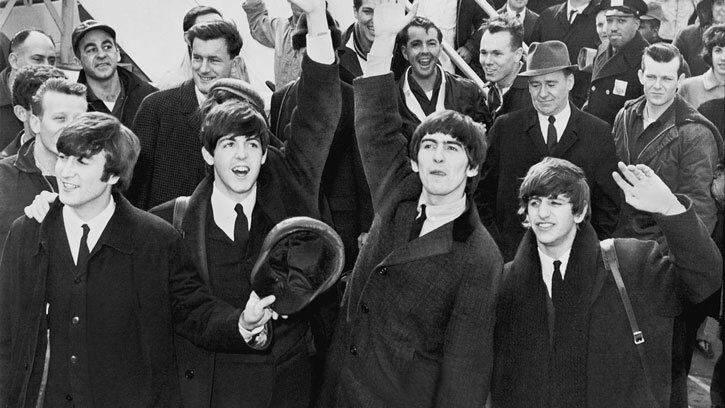 At first glance, it might seem that the Beatles, the most commercially successful band of all time, and Berio, an avant-garde, European composer working in the United States, would not have much in common. Despite their stylistic differences, however, the two shared a mutual admiration for each other’s work and even a set of influences. Their shared musical influences would coalesce over the summer of 1968 into two works that have many remarkable similarities: the third movement of Berio’s Sinfonia and the Beatles’ “Revolution 9” from their White Album. According to musicologist Walter Everett, Paul McCartney sought out concerts featuring the music of modernist composers during the summer of 1966, including Berio, John Cage and Karlheinz Stockhausen. At the time, McCartney was searching for inspiration for his own songwriting and was dabbling with tape loops and electronic music in his home studio. There is at least one documented encounter between Berio and McCartney dating from that year, although they otherwise admired each other’s work from afar. After listening to Berio present a lecture at the Italian Cultural Institute in New York, McCartney and the composer briefly met in the hallway outside the auditorium, but they were almost immediately driven apart by a crush of reporters. That meeting, although brief, seems to have inspired Berio. The following year, he arranged a series of songs by the Beatles for soprano Cathy Berberian and published an article praising the Beatles in Nuova Rivista Musicale Italiana, Italy’s most prestigious academic music journal at the time. Other than that brief encounter, however, it seems that Berio and McCartney otherwise lived and worked in separate spheres. They did, however, share many common musical influences. Stockhausen’s early electronic works, and Gesang der Jünglinge in particular, influenced Lennon, McCartney, and Berio alike. The piece, created in 1955-56, integrated electronic sounds with recordings of the human voice. According to an account of Lennon’s life by his friend Pete Shotton, Lennon too had become infatuated with Stockhausen’s music by May of 1968, just prior to creating “Revolution 9.” It’s worth noting at this point that the Beatles even included a picture of Stockhausen on the cover of their 1967 album, Sgt. Pepper’s Lonely Hearts Band. 1968 was a volatile year in the United States. It saw the assassinations of both Martin Luther King, Jr. in April and Robert Kennedy, the democratic Presidential nominee, in June. It was also the deadliest year of the Vietnam War — 16,899 U.S. soldiers died in the conflict that year — and student protests were sweeping the nation. Berio began work on his Sinfonia in the aftermath of King’s assassination, dedicating what would become the haunting second movement to his memory. The third movement — a swirling vortex of musical and literary quotes — would follow later that summer. The heart of his Sinfonia, Berio created the third movement by layering an array of spoken and instrumental quotations over the the scherzo movement of Mahler’s Second Symphony. Mixed in among the many fragments from Bach, Beethoven, Mahler, Ravel, Schoenberg and Strauss are excerpts from Samuel Beckett’s novel, The Unnamable. That same summer, the Beatles were working on what would become their eponymous album. Among the 30 tracks they released on The Beatles was “Revolution 9,” an experimental tape piece created by John Lennon, Yoko Ono, George Harrison and, to a lesser extent, Paul McCartney. The track was recorded over the months of May and June of 1968, at the same time Berio was writing his Sinfonia. Among the sample of sounds that appear in “Revolution 9” are several samples from classical music, including Beethoven’s Choral Fantasy, Sibelius’ Symphony No. 7, and Schumann’s Symphonic Studies. Similar to Berio’s Sinfonia, it also features spoken text, including recordings of American football games and Lennon and Harrison speaking. The two works were released almost simultaneously. Berio’s Sinfonia was premiered by the New York Philharmonic on October 10, 1968, about a month before the Beatles released the White Album in the United States on November 25, 1968. Working in their respective mediums — the recording studio for the Beatles and the orchestra for Berio — both artists created remarkably similar works at the same time. The question, then, is: why? The title Sinfonia bears no relationship to the classical form — rather it must be understood in its etymological sense of ‘sounding together’ of eight voices and instruments or, in a larger sense, of ‘sounding together’ of different things, situations and meanings. This idea of “sounding together” is important, not just to the history of the symphony and Berio’s musical inspiration, but to how we can understand both the Sinfonia and “Revolution 9.” 1968 was a time of national debate and upheaval, of competing ideologies and a fight for basic human rights. Everyone was shouting at once. If music reflects the time in which it is created, it is easy to listen to the sometimes chaotic strains of both works as a reflection of the United States in 1968, refracted through the musical mediums of the artists. Reserve your seats to hear Music Director Ludovic Morlot, guest artists Roomful of Teeth and the Seattle Symphony perform Berio’s Sinfonia on February 4 and 6. Peter Ames Carlin: Paul McCartney: A Life. Walter Everett: The Beatles as Musicians: Revolver through the Anthology. Barry Miles: Paul McCartney: Many Years from Now. Pete Shotton and Nicholas Schaffner: John Lennon In My Life. Richard Taruskin: Music in the Late Twentieth Century: The Oxford History of Western Music.